It’s all about Christmas this month at Hot Rocks, even though it’s an endless summer! 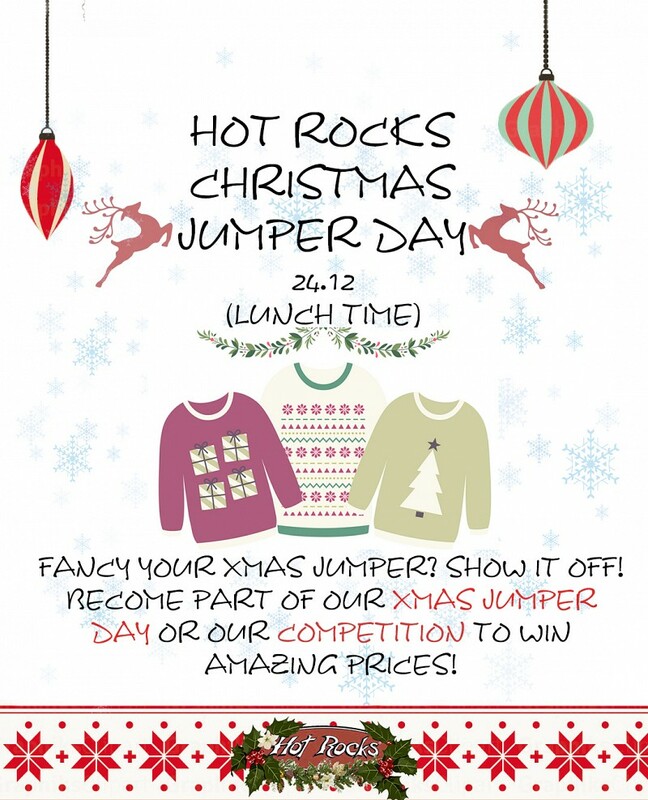 We are delighted to announce our own Christmas Jumper Day, officialy taking place on Sunday, the 24th December. We are open until the afternoon, and YOU are invited to join us for a lovely lunch by the seaside. Dress code: Christmas Jumpers all the way! Everybody that join us dressed up will get a complimentary glass of mulled wine to accompany your meal (non-alcoholic options available). https://www.facebook.com/HotRocksBmouth/photos/a.4… ), wearing your jumper or simply send us your pictures to bookings@hotrocks.com for a chance to win Hot Rocks’s special wood-fired pizza dinner for 2!